The milestones for this phase have been completed. Check out the current roadmap. One of the most requested improvements was the ability to update Apps from within the workspace. In this update we are going to move the App Builder functionality to the workspace. Once the update is released, you will be able to to update Fields and Dashboards without having to go back and forth between the workspace and the admin section. Flexible Dashboard layouts have always been one of the most requested features. Right now, you are still only allowed to choose a Dashboard layout from one of the three predefined templates. In future updates, we will be removing this Dashboard layout limitation. You will be able to create your custom Dashboard layouts, move widgets around and resize them as you please. You will also be able to mix all widget types in a single Dashboard. Introduction of daily/weekly roundups. The introduction of daily and weekly roundups will help you take control of your daily workflow while letting you know what your colleagues are working on. New notification settings. The new settings will give you more control over what types of notifications you receive. For example, you might want to disable all of your notifications except for @mentions. Ability to receive notifications by email. Emails will be sent to alert you when you are mentioned in a particular discussion. The Math Calculation will also be undergoing some major updates. Calculations on related Apps. You will be able to create calculations on Link to App Fields. For example, if you have a Projects and Tasks App, you will be able to create a new Field on your Projects that calculates the SUM of the related Tasks durations. Improve ease of use. You will be able to select Fields in formulas, without the need to write the Field names yourself. Automatically recalculate Math calculations. Fusioo will automatically recalculate record data when updates to a Math Calculation formula are made. Fields are Fusioo's building blocks. Recurring Dates and reminders. You will be able to set up recurring Dates and get reminded either through in-app notifications or via email. Improve Select Field. The Select Field will undergo several changes, including sorting and color formatting. Auto-Increment Field. You will be able to change any existing Number Field into an auto-increment Field. This means that a number is assigned automatically when a new record is created. This is very helpful when you need to automatically assign a unique value or ID to every record. Improved notifications. Notifications will be grouped into 3 different sections (Discussions, Updates and All) to make it easier to find relevant updates. You will be able to mark notifications as read/unread and optionally show only unread notifications. Improved user experience when accessing records. The same functionality will be available from both the Edit record popup and the full record page. Things like discussions, activity, developer information, copy record and delete record will all be accessible from the Edit record popup. One of our goals is to drammatically reduce the time required when it comes to editing existing records. You'll be able to edit record details with a single click (or using keyboard navigation) directly from the List View. Field sections will allow you to group Fields together and create your custom record layout. This will dramatically improve data entry and Field organization. 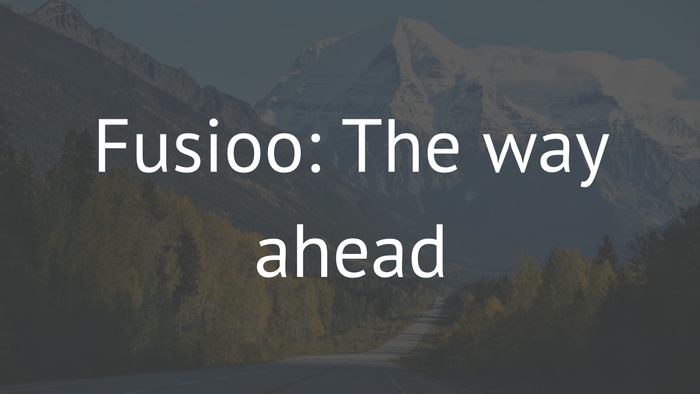 Apart from improving your Fusioo experience, we'll be working on helping you migrate more of your existing business processes into Fusioo. Workflows are the initial step to help us achieve this goal. With Workflows, it will be easy for you to perform different actions based on an event that happens in Fusioo. Send an email to Person X when a project with Budget > $25,000 is added to Fusioo. Create the initial 5 tasks related to an Event when an Event of type X is added to Fusioo. Automatically update the value of specific Fields when the status of a record is updated. If you feel like we are missing something that might really improve Fusioo, please feel free to contact us via 📧 or 💬!